In my previous post I set out my four-point plan to ‘regain my mojo’ and get my creative juices flowing again. One of the ways of doing this was by setting myself the challenge of visiting at least one gallery/exhibition per month. Well, despite the weather last Saturday, I went to the Mead Gallery at the Warwick Arts Centre in Coventry to see ‘Uncommon Ground – Land Art in Britain 1966-1979. This exhibition chronicles how some of the most radical artists of the time moved out of their studios and engaged in a direct dialogue with the landscape thus challenging established art boundaries. This dialogue took the form of performances or actions within the landscape and was recorded by means of video, text or photographs. Alongside the work that documented actions or performances was the use by artists of materials found and gathered within the landscape. Sometimes this material was used in situ and at other times it was brought into the studio to make sculptures. This latter group includes some of my favourite artists – Richard Long, Andy Goldsworthy, Antony Gormley, David Nash, Tony Cragg… – and their work is well represented in the exhibition. 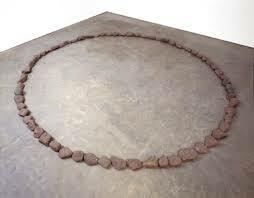 Indeed the first piece you see on entering the gallery is Richard Long’s Stone Circle from 1972. Comprising of a ring of 61 sea worn stones, differing in size, colour and shape, it highlights how diverse the environment is even within a small area – if you look hard enough! Antony Gormley’s Flat Tree from 1978 is one of his earlier works and is another piece that really caught my eye. A conifer trunk has been cut into slices of equal thickness and then, beginning with the smallest, the pieces have been laid in a spiral, in such a way that they all touch. Looking at the pieces of trunk I defy anyone not to start counting the rings to determine the age of the tree – and this idea of time is surely part of the work. The time it took for the tree to grow, for Gormley to slice it up and then to lay it in a spiral – from apparent destruction comes creation. New Stones – Newton’s Tones, Tony Cragg’s 1978 work highlights, amongst other things, the growing ecological concerns of the time. 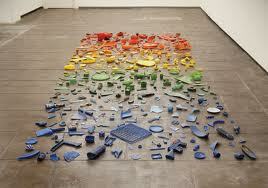 Man-made objects Cragg found on his walks along the Rhine are sorted and displayed on the floor with the sequence of colours mirroring that of the spectrum of white light as identified by Newton. 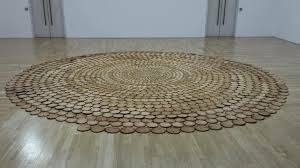 The piece resembles some of Richard Long’s floor pieces, but whereas Long’s works are created using natural materials, Cragg uses products of modern technology. On the one hand I found it depressing to see the impact that humans are having on the earth but, from an artistic point of view, I did like the juxtaposition of the natural with the manmade products. Although it would appear from the above that I only like those artists who work within the landscape (and whilst that might be true to a certain extent), it would be unfair not to mention some of the other work that is of a more performative nature. I particularly liked the work of Hamish Fulton – Callanish – A Five Day, One Hundred Mile Walk and Richard Long’s Footstones – A 126 Mile Walk Across England. The work certainly puts into practice the ‘take only photos, leave only footprints’ poem! I’m not normally a big fan of video work but strangely I also liked Derek Jarman’s film A Journey to Avebury – it was very evocative of the passage of time as well as of physically travelling through the landscape. Roger Ackling’s Cloud Drawings are delicate images of the changing light conditions and are again, worth a closer look. Whilst I was at the gallery I tagged onto an exhibition tour given by one of the gallery curators. She gave a very informative tour in a relaxed manner with plenty of anecdotes and I would highly recommend joining one of these groups to get an overview of the exhibition. Overall I found the exhibition very interesting and it definitely highlighted the forms that Land Art took during this period. Well worth a visit! As far as regaining my mojo plan – well this visit has certainly inspired me to get out and about more and see what’s going on in the art world. It even inspired me to pick up my pencil again, with attitude I might add…but that’s a post for another day!! My blog has been quiet of late owing, in part, to the fact that, after all the hoo-ha of the final year at uni and subsequent exhibition at Cromford Mills, I found myself at a crossroads as to what I was going to do next! 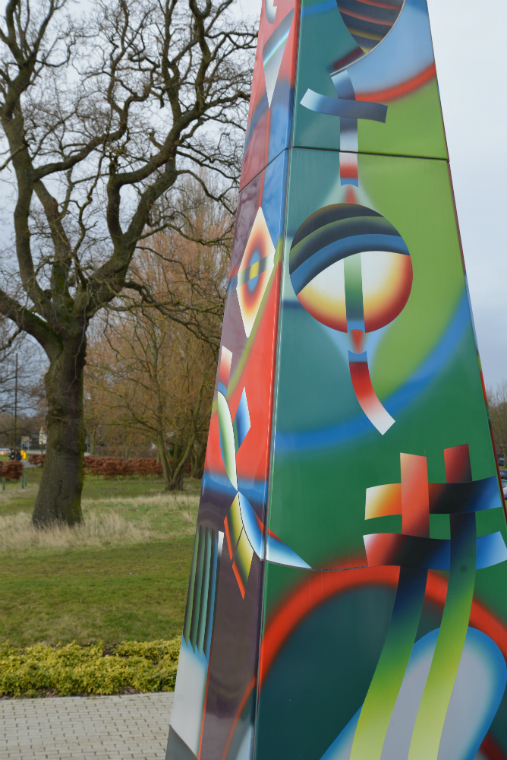 Although my Connecting Threads installation is being exhibited at the Charnwood Museueum, Loughborough from 5th April – 1st June this year, I was totally lacking in inspiration for further work. For me, Connecting Threads was so far out of my comfort zone that it became all-consuming; for about a year I hardly thought or did anything else. So much so, that when I tried to return to my roots and do some drawing my confidence (not great at the best of times) was shattered – faced with that white piece of paper I was totally inhibited and couldn’t even make the simplest of marks, so much pressure was I putting on myself to come up with another concept to equal Connecting Threads. I suppose it was the equivalent to writer’s block. As 2014 began I knew I couldn’t carry on like this so I went back to basics…and devised a four-point plan to lift my spirits and hopefully kickstart my creative juices! Connecting Threads arose from my love of drawing but how was I going to conquer my ‘white paper syndrome’? 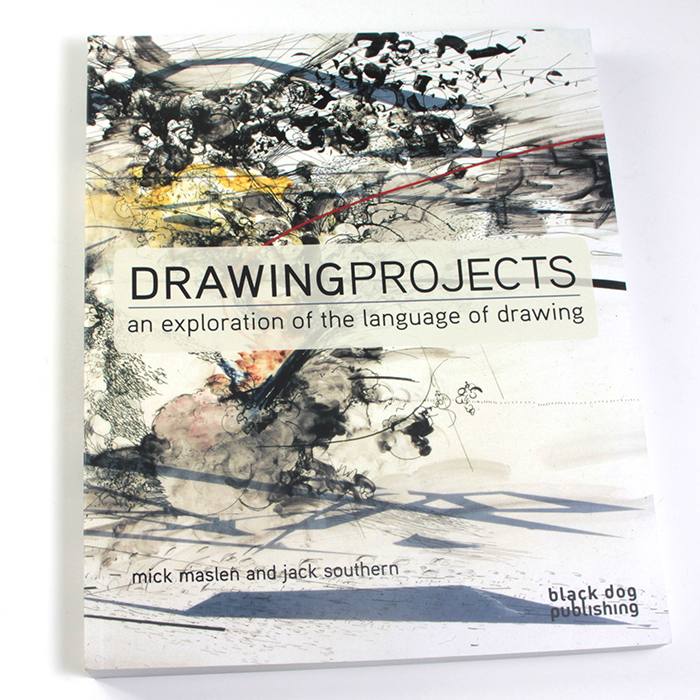 Well one of the books I referred to for my dissertation was ‘Drawing Projects – an exploration of the language of drawing’ by Mick Maslen and Jack Southern. Interspersed with interviews with established artists about the way in which they use and view drawing within their own practice, there are a series of projects or exercises designed to help you think more about drawing as marks rather than a finished piece. Thinking about drawing in this way removes the pressure of assuming you have to create a masterpiece each time so I have decided to work my way through the projects. I will let you know how I get on…Even just making the above decision has felt like a weight has been lifted from my shoulders and I feel much more positive. I think a contributing factor to my lack of inspiration is that, feeling downhearted, I have shut myself away. So in order to overcome this isolation the other parts of my ‘Regain my mojo’ plan are to try and visit a gallery/exhibition at least once a month and try to do some workshops with artist’s whose work I like as well as work my way through my artistic book wishlist, which is quite long! Again, I will keep you updated with my progress in further posts.